Kevin and Dawn from Deal in Kent are pictured proudly taking delivery of their Bailey AUTOGRAPH 740 model from Shane Catterick at T C Motorhomes. Whilst both Kevin and Dawn both lead busy lives with work commitments, they are both determined to find sufficient time to enjoy their new purchase and in fact are already planning their first trips for this year, which will include some European destinations. When all added up and taken into consideration, the decision was simple..
Shane and his colleagues at T C Motorhomes wish Kevin and Dawn all the best with their Bailey Autograph, and thank them for their valued business, and support. 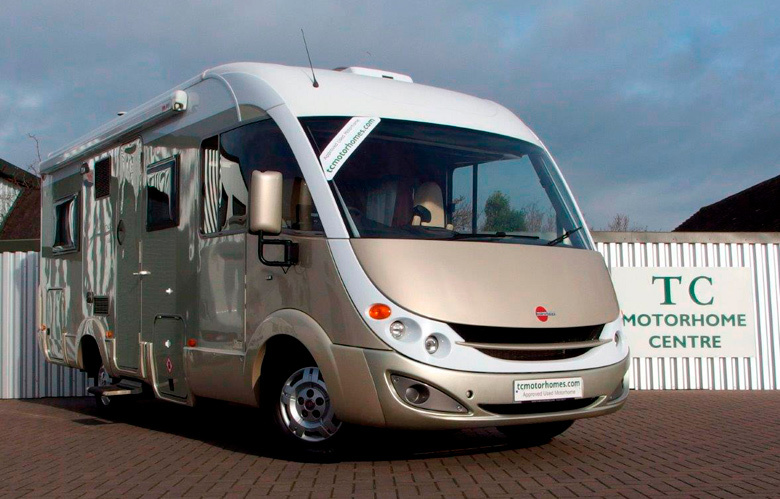 Visit our Used Motorhome page to view the vehicles we currently have in stock. There are only a few days left until the Caravan Camping and Motorhome Show 2018 starts. If you are unsure if you want to attend and wondering what you will do there, here is a list of the speakers who are attending this years show. 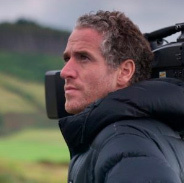 Award-winning wildlife cameraman, presenter and public speaker, Gordon has recently been on our screens in the highly acclaimed Elephant Family And Me and Life in the Snow on BBC One and Life in Polar Bear Town and Tribes, Predators and Me on BBC Two whilst completing another nationwide UK theatre tour. See Gordon in the Discovery Theatre. Comedian, TV Presenter, writer and musician, Rowland Rivron will share his fond and funny memories of caravanning holidays with his wife Monica and family. 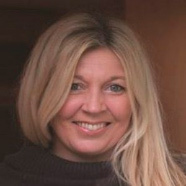 Caravan fan and passionate outdoor chef, Monica Rivron, will be showing off her caravan cooking skills. The Caravan Cookbook author will be cooking up delicious caravan friendly meals for all the family. Senior road tester for MMM and our resident motorhome expert. What Dave doesn’t know about motorhomes isn’t worth knowing, so come and listen to his unmissable advice. Dave’s sessions are geared towards those looking to buy so don’t miss the golden opportunity to learn more about how to choose what’s best for you. See Dave every day in the Discovery Theatre. Dean Edwards’ family-friendly cooking style has made him a firm favourite on ITV’s Lorraine. After bursting on to the chef circuit – coming second in BBC’s Masterchef Goes Large in 2006 – he left his career as a ‘digger driver’ to pursue his love of cooking and food. A stint at the two-Michelin-starred Midsummer House in Cambridge followed. Dean is the author of two cookbooks – Mincespiration and, most recently, Feel-Good Family Food. Chelsea Ladies captain, Katie Chapman, is one of the most decorated players in the women’s game and has represented England at two World Cups and three European Championships. See Katie in the Discovery Theatre on Thursday 22 February 2018. 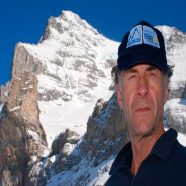 Sir Ranulph Fiennes was, with Charles Burton, the first man to reach both poles by surface travel and, with Mike Stroud, the first to cross the Antarctic Continent unsupported. In the 1960s he was removed from the SAS Regiment for misuse of explosives but, joining the army of the Sultan of Oman, received that country’s Bravery Medal on active service in 1971. He is the only person yet to have been awarded two clasps to the Polar medal for both Antarctic and the Arctic regions. Fiennes has led over 30 expeditions including the first polar circumnavigation of the Earth, and in 2003 he ran seven marathons in seven days on seven continents in aid of the British Heart Foundation, 3½ months after a massive heart attack. Anna is an endurance athlete, adventurer and mischief maker. Once upon a time she represented Great Britain at rowing, but after ‘retiring’ in her mid twenties, she began darting around the world on the hunt for new and exciting endurance challenges. She has cycled over 20,000 miles in Europe and the Americas, including through all 50 states of the USA. She has also run the length of New Zealand, and has a penchant for rollerblading. Passionate about the positive impact that adventure and sport can have on the lives of youngsters, Anna uses her human-powered journeys as a platform to inspire and enable kids to get outside, and get exploring. See Anna in the Discovery Theatre on Friday 23 February. 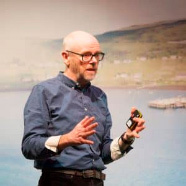 Andy Torbet is a broadcaster and adventurer best-known for his work on the likes of The One Show, Coast, Operation Iceberg, Cloud Lab and The People Remember. Now he’s writing about the outdoors for Camping & Caravanning magazine, extolling the virtues of the touring lifestyle in a campervan he calls ‘The Office’. Camping is something he’s passionate about and finds time for, whether it’s during work or in his spare time. See Andy in the Discovery Theatre on Friday 23 February at 2:45pm. Rustie first came to attention in the 1980s as the bubbly chef on TV-am and presenter of Game for a Laugh but she recently appeared among the celebrity retirees in popular BBC series The Real Marigold Hotel. Rustie is a long-standing favourite on our screens – winning paranormal-themed reality show I’m Famous and Frightened! and making appearances on This Morning, The Alan Titchmarsh Show, Loose Women and Daily Cooks/Saturday Cooks among other shows. Rustie often features on Channel 5’s Big Brother’s Bit on the Side and has also appeared on the channel’s reality show Celebrity Super Spa. 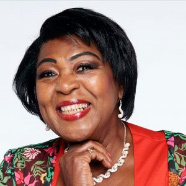 Rustie has written several cookbooks, including Rustie Lee’s Caribbean Cookbook (1985) and A Taste of the Caribbean (2007). Simon McGrath is the author of Camping with Kids and an award-winning journalist. He began his career in journalism 30 years ago and for nearly a decade was Editor of Camping & Caravanning magazine, the world’s oldest and largest circulating title for all types of camping which is published each month by The Camping and Caravanning Club. 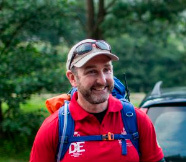 Simon is passionate about encouraging people, especially youngsters, to enjoy the great outdoors – and he feels the best way to do that is through camping. See Simon in the Discovery Theatre on Saturday and Sunday. 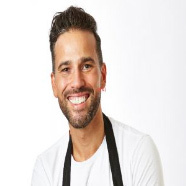 After a TV production company first stumbled across Chris in 2011 he has gone from strength to strength and is currently co-presenting his fourth series of BBC1’s hugely successful series Eat Well for Less? with Gregg Wallace. The show has had incredible ratings across its first three series with the next two to be aired later on this year. In addition to Eat Well for Less, Chris has presented Tomorrow’s Food with Dara O’Brian, The Truth about Meat and he is co-presenter of BBC1’s returning series Food:truth or scare with Gloria Hunninford. Simon McGrath will be visiting again on Sunday 25th February. Angela & Graham from Ramsgate, have returned to T C Motorhomes and part exchanged their Swift Sundance Motorhome that they bought from T C `s a few years ago and replaced it now with an immaculate Rollerteam Auto-roller 695, that has a slightly different layout to the Swift, but a lot more luxuries, including Cab Air-Conditioning! They are both keen live music fans and especially enjoy some of the Blue Grass and Country music bands and intend to make good use out of their Autoroller, both in this country and abroad travelling and listening to live music with a close group of caravanning and motorhoming friends. Shane Catterick and his colleagues at T C `s would like to thank Angela and Graham for their valued order and continued support. Click on the link to find out more about current range of Used Motorhomes currently available from TC Motorhomes. We still have some free tickets available for this event. If you would like a ticket please contact us: 01227 289111 or visit our contact page on our website and request them via our contact form. The show will have all new features and the latest inovations for Motorhoming in 2018. It’s the UK’s biggest showcase of motorhomes, campervans, caravans, caravan holiday homes and lodges. Plus new season tents of all sizes, trailer tents and folding caravans all under one roof. Not only will you be able to see all the new season models and products, you can stock up on all your holiday accessories as well as gather ideas, inspiration, and advice on where to go and what to do when you get there. Whether you’re looking to get into the leisure vehicle lifestyle or already enjoy it, your holiday, short break or outdoor pursuit starts here! It’s a great family day out too, with lots of free activities and attractions for everyone to enjoy. Don’t miss our brand new Holiday Park Experience, bringing a park holiday to life for you, including a climbing wall, play area, bushcraft classes and more. And that’s not all, other features include a top dog arena, a Discovery Theatre offering a full programme of inspirational and informative speakers – some of whom you may recognise, live cookery demonstrations and taster towing and motorhome manoeuvring tuition. The Burstner Aviano I684 is a 4 x berth `A` class motorhome with good looks, high quality & practicality all rolled into one motorhome. Our Aviano has a beautiful combination of cream leather and contrasting cloth trim, which give the interior a light, bright & spacious feel. 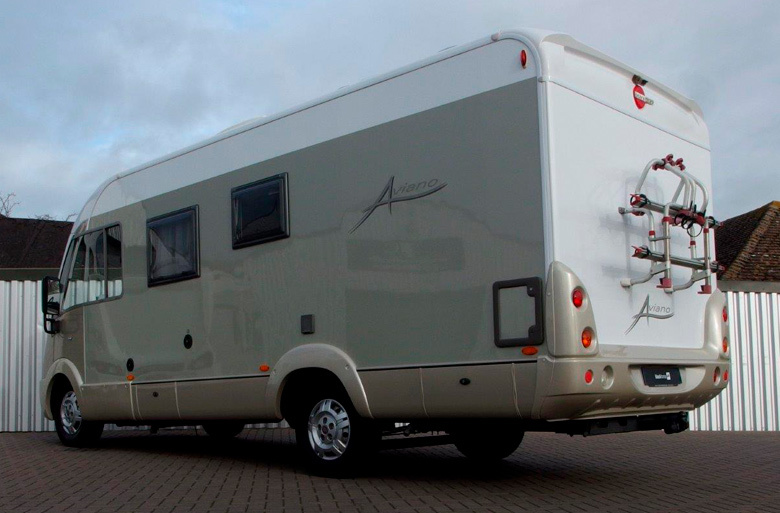 The Aviano has a large comfortable forward lounge with cab captains chairs that can swivel around when required a `mid` kitchen and a rear fixed `french bed` and an adjacent washroom alongside. 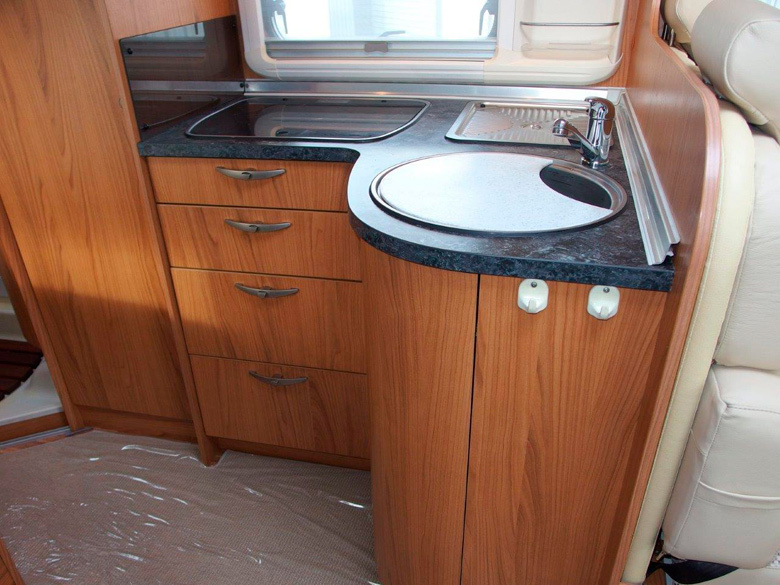 The kitchen is compact with extensive cupboard storage and offers a 3 x gas burner hob, sink and separate drainer and a large 3 x way fridge with separate freezer compartment, and a `dometic` grill / oven over the top of the fridge. 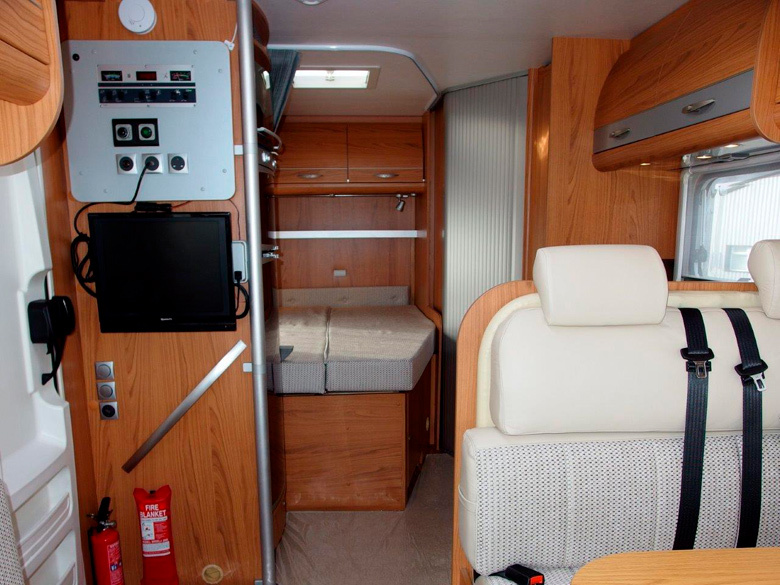 This particular Burstner AVIANO has some dealer accessories which include a Side Wind-Out Sun Shade, a `Toad` Alarm System, A Reversing Camera, and a Tow Bar. Call us now to arrange a viewing! 01227 289111 or CLICK HERE to view more images and make an enquiry. 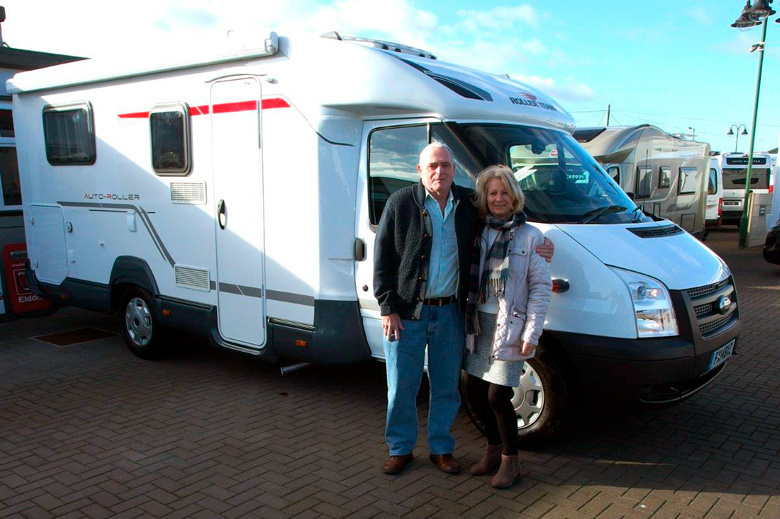 Jane and Mark are pictured taking delivery of their brand new Chausson 738 XLB Welcome `Smart Lounge` motorhome. This replaces a Chausson 530 Welcome model that they purchased from Peter at T C `s last year, that proved to be ideal for shorter more local touring where luggage was not an issue, however was a little bit space challenged on some of the longer excursions that Jane and Mark enjoy. Mark, who used to play a lot of quality Rugby, and is 6` 7” feet tall, also likes the large comfortable `Fixed Bed` in the 738 model. Peter Oliver and all of the Team at T C `s would like to thank Jane and Mark for their continued support and wish them `All The Best` for a busy year of Motorhoming Fun! Trudy and Chris from Chatham Kent were recommended to T C Motorhomes for their first motorhome purchase by Debs and Steve of Gillingham who are both regularly out motorhoming in their new Chausson 728, they have fountains of important Motorhome knowledge and Know-How, very good friends of Chris & Trudy and very good customers of T C `s.
With nothing seemingly suitable or available at the Detling Motorhome Show in June last year, Chis & Trudy decided to visit the NEC Indoor Motorhome Show at Birmingham in October last year. 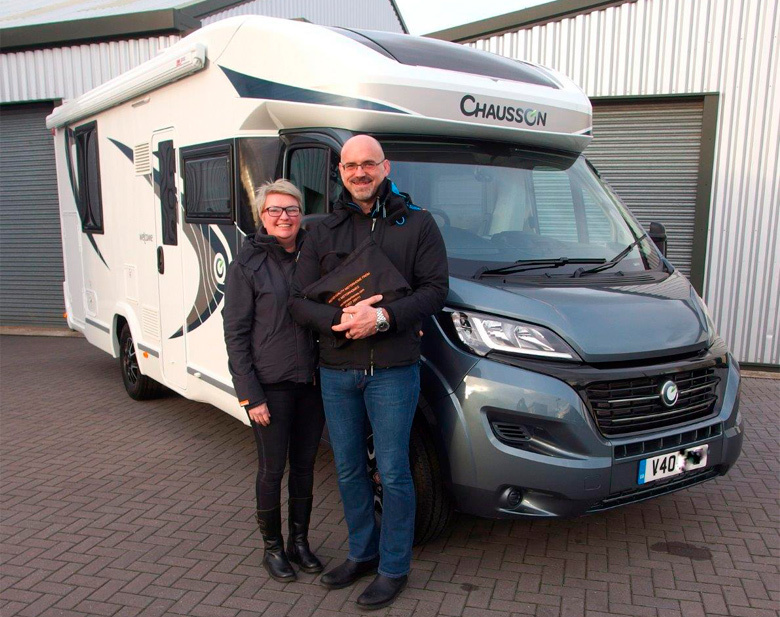 There, they once again met with Shane Catterick of T C Motorhomes who introduced them to the all new Chausson 718 XLB SE, which seemed to be offering most of what Chris & Trudy wanted in their new motorhome. A deal was struck at the show and they have just taken delivery of their fantastic new Chausson Motorhome and are now busy planning their first outings with their good friends. Trudy added, "if we have forgotten how an appliance works, Debs & Steve will have the answer". 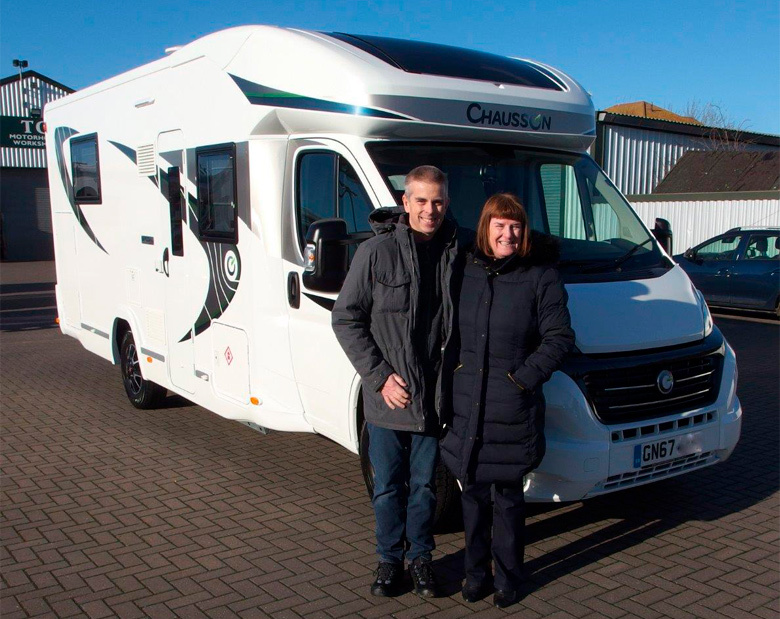 Shane Catterick and his colleagues at T C Motorhomes would like to take this opportunity to thank Debs & Steve for their recommendation, and of course Trudy & Chris themselves for having the faith to place their order for a New Chausson Motorhome from us. So far so good, the are loving every minute! 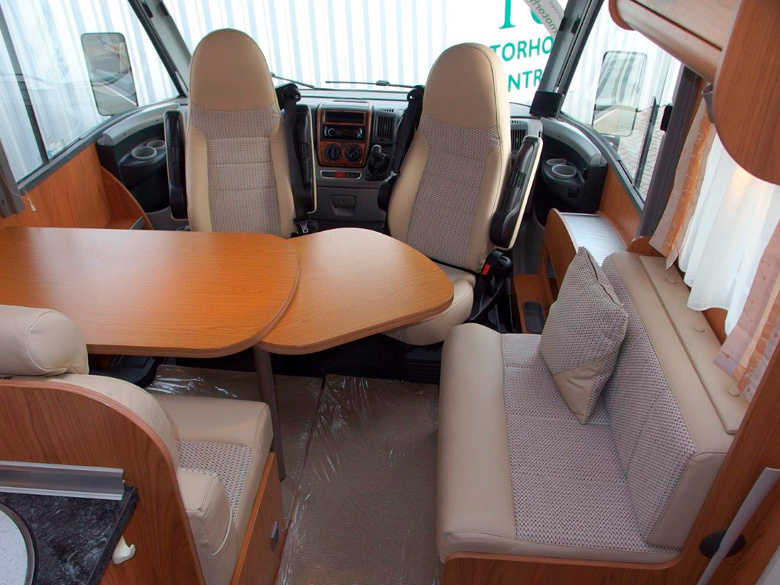 For more information please contact Shane Catterick at T C Motorhomes.